Lake Marble Falls (also known as Max Starcke Dam) is located near the town of Marble Falls in Burnet County, on the Colorado River. The reservoir is owned and operated by the Lower Colorado River Authority for the primary purposes of generating hydroelectric power and water supply. Max Starcke Dam, originally named Marble Falls Dam, was renamed in 1962 for Max Starcke, the second general director of the LCRA. The project was authorized by Permit No. 998 dated November 4, 1927 from the State Board of Water Engineers. Construction of the dam started in November 1949 and was completed in October 1951. Deliberate impoundment of water began in July 1951. The dam is a concrete gravity structure of 860 feet long including the spillway, powerhouse, and other facilities. The top of the dam is at elevation, 738 feet above mean sea level. Spillway is controlled by 10 roof-weir floodgates, each 60 feet wide and 15 feet high, with a crest at elevation, 725 feet above mean sea level. Maximum design water surface is 758 feet above mean sea level, while design 100-year flood level dam is 754.3 feet above mean sea level. Recorded historic high water level is 756.3 feet above mean sea level on September 11, 1952. According to TWDB 2007 volumetric survey, the lake has a capacity of 7,486 acre-feet encompassing a surface area of 608 acres at the elevation of 738 feet above mean sea level. The drainage area above the dam is 36,325 square miles, of which 11,900 square miles is non-contributing. The water level in the lake is regulated by upstream reservoirs and power plant operation. Idea of the Highland Lakes chain originated in the mid-19th century. The credit for the idea of a dam on the Colorado may go to Adam Rankin Johnson, a farmer and entrepreneur who established the city of Marble Falls. In 1854 he marked an “X” at a location where one of the dams should be built. Johnson secured the water rights for a multi-dam project but never developed his idea. He eventually sold his rights to C. H. Alexander, Sr. In 1909 he began construction of a dam near Marble Falls but was able to build only one-third of the structure before his money ran out. Downstream, the City of Austin briefly succeeded in building the first dam across the Colorado. That structure lasted only seven years before being destroyed by a catastrophic flood in 1900. The city had barely finished rebuilding the dam in 1915 when it was again heavily damaged by floods. Bankruptcy of dam builder leads to LCRA’s creation. In the 1920s, catastrophic floods across the United States, coupled with the construction of massive Boulder Dam in the West, increased national interest in dam projects that coupled hydroelectric power generation with flood control. That led one utility company in 1931, which had purchased Alexander’s rights, to begin building a massive structure on the Colorado at the location marked by Johnson. But a year later, less than halfway through construction, the company went bankrupt, a victim of the Great Depression and corporate mismanagement. In the 1920s, catastrophic floods across the United States, coupled with the construction of massive Boulder Dam in the West, increased national interest in dam projects that coupled hydroelectric power generation with flood control. One utility company that had purchased Alexander’s rights , began building a massive structure on the Colorado. But just a year later, less than halfway through construction, the company went bankrupt, a victim of the Great Depression and corporate mismanagement. The abandoned dam passed into the hands of Alvin Wirtz, a savvy attorney and former state senator who eventually secured the promise of federal funds if a state agency could be created to finish the project. Thanks to his influence, the Texas Legislature eventually created LCRA in November 1934. Possessed with the defunct utility’s properties and fortified with $20 million in federal grants and loans, LCRA resumed construction of what eventually became Buchanan Dam and a companion project, Inks Dam, downstream. The work provided hundreds of jobs to depression-stricken families. Completed in 1938, the two dams were designed to offer the hydroelectric production and flood protection that the project’s originators had promised. 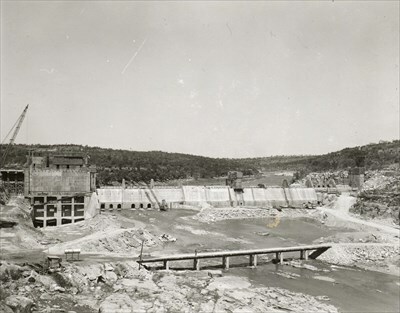 The water in Lake Buchanan would provide the “fuel” for the Buchanan Dam powerhouse, and the dam sported 37 floodgates to moderate the release of Hill Country floodwaters. As waters from Buchanan flowed into Inks Lake downstream, Inks Dam would discharge the flows through its own powerhouse, increasing the waters’ hydroelectric output. With Buchanan and Inks dams completed, Mansfield Dam was planned for additional flood protection.